Be sure to read the multi rail page before reading about current limit problems. You may well ask why you should care which kind of 12 volt rails your PSU actually has. If you've got a run-of-the-mill computer then it probably doesn't matter. But if you've got a high-speed fire-breathing gaming rig with two high-end video cards then those 12 volt rail current limits can cause your computer to shut down unexpectedly while fully loaded. The computer will run just fine until you hit a peak current which exceeds the limit on one of your 12 volt rails and then the machine turns off like you've just pulled the plug. Below is a list of peak 12 volt loads for some components. Most computers don't have CPUs or video cards which approach 10 amps on 12 volts. But serious PC gamers sometimes do. Some gamers have two video cards installed in their computers for higher performance. So some computers can have two or even three 12 volt power hogs. If you have a single 12 PSU then the main thing you have to worry about is making sure that your PSU can deliver the total amps you need on the 12 volt rail. But if you have a current limited 12s PSU then you also have to make sure not to exceed the current limit on each 12 volt rail. You can definitely exceed the current limit if you have two 12 volt hogs on the same rail especially if you also have other things like hard disks on that rail. If you balance your rails by making sure that you have only one 12 volt hog on each 12 volt rail then your current limited 12s PSU is unlikely to ever hit its current limit. Of course, if you've got three hogs and two rails then you may have a serious problem. This brings up the question of how you know which load is connected to which rail. The ATX spec defines the use of each 12 volt rail for dual 12 volt rail ATX12V PSUs. The two rails are called 12V1 and 12V2. 12V2 is used to power the CPU through the 4 pin 12 volt power cable. 12V1 is connected to every other 12 volt cable. At least that's the standard. Not everyone obeys it. As far as I know, all dual 12 volt rail PSUs connect 12V2 to the 4 pin 12 volt power cable. And most PSUs connect the 12V1 rail to all their other power connectors. But some PSUs apparently use 12V2 to power some cables which according to the spec are supposed to be powered by 12V1. Unfortunately, they usually don't tell you which power connector is hooked to which rail. EPS PSUs can have up to four 12 volt rails. EPS supplies have an 8 pin 12 volt power cable which is used to power the CPU(s). 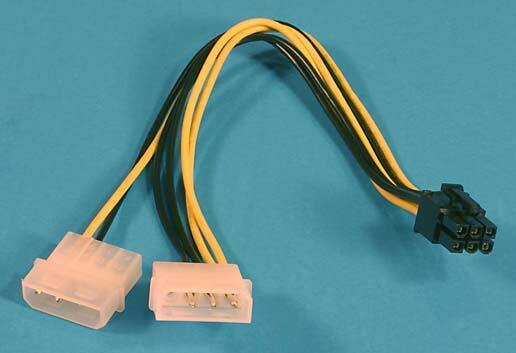 Depending on the PSU, the 8 pin power cable may contain 12V1 or both 12V1 and 12V2. Then 12V3 and 12V4 can be used for various things. Suffice it to say that it gets a bit confusing even if they obey the specifications (which sometimes they don't). If you have a modular PSU then there are a bunch of connectors on the back of the PSU into which you plug your power cables. Each of the connectors on the PSU is connected to one of your 12 volt rails. That allows you to select the 12 volt rail for each power cable by plugging it into the appropriate connector on the PSU. All you have to do is find out which PSU connector is hooked to which rail. There are some Fortron (FSP) PSUs which have the 12 volt rail connections printed on the label on the side of the supply. Thank you, Fortron! If only all PSU makers did that. If they're not that considerate then you should check the PSU manual and website. Quite often you can scare up the information about a popular power supply by googling because people having problems with a PSU tend to discuss this subject in help forums. One thing you need to consider is that the published maximum currents for each 12 volt rail may not be the real maximums. Suppose you have a PSU which says that its 12V1 maxes out at 18 amps and the 12V2 at 14 amps. It's entirely possible that the limits they've given you are accurate. But if you're dealing with a current limited 12s supply then the individual limits they gave you for 12V1 and 12V2 may be all wrong. A current limited 12s PSU contains a current limiter on each 12 volt rail and it only needs to be set to 20 amps to meet ATX12V requirements. Anything smaller than 20 amps is just going to increase the likelihood that you hit a current limit on one of the rails. When people's machines start turning off unexpectedly they have a habit of returning their power supplies thinking something's broken. PSU manufacturers hate that. Going below the 20 amp limit is inviting trouble. It's true that most machines don't get close to the 20 amp limit so it's not that big of a problem but I don't think PSU makers would intentionally increase their return rates if they don't have to. In the case up above, the claimed limits of 18 and 14 amps may both well be 20 amps with a total limit for both rails of 32 amps. If the PSU specs include a maximum wattage for 12 volts then that would take precedence over summing the current limits of each 12 volt rail. I don't have a PSU with rails low enough to test this theory but I've seen comments by a number of people who do PSU tests for websites who have come to the same conclusion. You'll probably see lots of limits which are 18 and 19 amps rather than 20. That's probably just the PSU manufacturer being conservative when listing their current limits. Most electronics have a range of guaranteed values. If a current limiter was guaranteed accurate to 5% then you would know it wouldn't trigger until 19 to 21 amps. 10% would be 18 to 22. So they're probably just playing it safe by saying 18 or 19 amps rather than 20. To avoid hitting your current limit you need to evenly distribute your major 12 volt loads between the rails. Most of the time you have no choice which 12 volt rail powers your CPU. The PSU is wired one way and that's it. Some modular PSUs may allow you to move the CPU to a different rail. If you can't move your CPU to another 12 volt rail then you have to move something else. Unless you have lots of disk drives you only need to worry about your video cards. High-end video cards draw a large portion of their power from an auxiliary 12 volt power connector on the video card because motherboard slots can't provide enough power. For current video cards that's done through the 6 pin PCI-Express power cable. If you have a modular PSU with three or more 12 volt rails then it's as simple as changing which PSU connector your PCI-Express power cable is plugged into. If you're not sure which modular PSU connector is for which rail then just try them out until you find the connector which runs stably. If you don't have a modular PSU then you may also be able to use the adapter shown above to solve an overload problem. It converts two 4 pin peripheral power cables into a 6 pin PCI-Express power cable. That will place a good chunk of your video card's 12 volt load on whatever 12 volt rail powers your peripheral cables. Of course, if your PCI-Express connector is already on the same rail as the peripheral cables then it doesn't change anything. If you use one of those adapters be sure to plug both 4 pin peripheral connectors into different power supply cables. If you plug both of them into a single cable then you end up with the entire 12 volt video card load passing through a single wire. It usually works okay through one wire but you will suffer a larger voltage drop and the cable and connectors may get a bit warm. It's safer to plug them into separate perpipheral cables. If you have a dual 12 volt rails PSU then you may not be able to relocate your video cards to another rail. Most dual 12 volt rail PSUs wire the CPU to 12V2 and wire everything else to 12V1. That's the correct way to distribute one power hog CPU and one power hog video card but you can have problems with both video cards on the same 12 volt rail. Many CPUs don't draw that much 12 volt current so it would be more balanced if the CPU and one video card were on 12V2 and the other video card on 12V1. I've never seen an adapter which allowed you to attach a 6 pin PCI-Express power cable to the 4 pin 12 volt cable. If you're really hitting a single rail current limit and you can't redistribute the loads then you may get stuck getting a new power supply. Keep in mind that hitting the current limit on a 12 volt rail rarely happens. You usually need two serious power hogs running at peak load on a single rail before you can trip the overcurrent protection. There are other reasons a power supply can just shut down so you shouldn't jump to the conclusion that you exceeded the maximum current when it happens. Most high-end video cards don't draw enough power to exceed the current limit so search the Internet to find out how much your components really draw before assuming that this is your problem. Of course, you can avoid this whole rail balancing mess by getting a single 12 PSU. Sadly most of the high-power PSUs sold as of this writing (2006) are marketed as dual rail PSUs. Many of them may actually be single 12 PSUs but unfortunately they're not labeled as such. Hopefully as time passes, this brief flirtation with multi rail PSUs will end. Single 12 volt rail PSUs work just fine in PCs. If you're buying a new PSU for a high-end PC you can save yourself some potential misery by getting one.